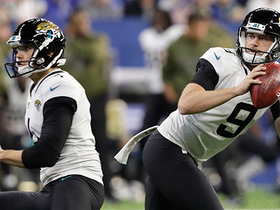 Analysis: O'Shaughnessy will be entering his fifth season in 2019 and his third with the Jaguars. He hasn't had much of a role in the passing game thus far in his career. He recorded 214 yards on 24 catches, both career highs, while playing in 14 games last season. He'll likely operate primarily as a blocker and backup tight end once again in 2019. O'Shaughnessy caught three of four targets for 25 yards in Sunday's loss to the Texans, and finished the season with 24 receptions for 214 yards and zero touchdowns. O'Shaughnessy recovered a fumble in Sunday's 17-7 win over the Dolphins. Analysis: O'Shaughnessy didn't receive a target despite playing 42 of 67 offensive snaps as his minimal offensive production continues. The 26-year-old has seven catches for 42 yards over the last six games, as the tight end position continues to produce essentially nothing in the passing game for the Jaguars. O'Shaughnessy caught his only target for seven yards in Sunday's 16-13 loss to the Redskins. Analysis: O'Shaugnessy hasn't reached 20 receiving yards since Week 10, and that didn't change Sunday as Jacksonville had only 57 passing yards. The 26-year-old should finish the season as the Jaguars' starting tight end but holds minimal fantasy value in an offense that hasn't scored a touchdown since November. O'Shaughnessy caught three of four targets for 12 yards in Thursday's loss at Tennessee. Analysis: O'Shaughnessy entered Thursday's game having caught three passes in the previous three games combined, but his increased involvement didn't equal increased production in this case. The 26-year-old remains in the starting role at tight end for the Jaguars -- he played 75 percent of offensive snaps Thursday -- and there's little reason to expect his fantasy outlook will change in the coming weeks in an offense that has scored a single touchdown over the last two games. O'Shaughnessy caught both of his targets for 19 yards in Sunday's 6-0 win over Indianapolis. Analysis: O'Shaughnessy started for a fifth straight game, but his snap share (67 percent) was actually the lowest it's been in any contest since Week 5. Regardless, playing time hasn't translated to opportunity in the passing game, with the 2015 fifth-round pick recording three consecutive outings with exactly two targets. There isn't much reason to expect more work in a Week 14 road game against the Titans. O'Shaughnessy didn't catch either of his two targets in Sunday's 24-21 loss to Buffalo. Analysis: O'Shaughnessy -- along with the rest of the Jaguars' pass catchers -- has been invisible the last two weeks with one catch for four yards on four targets over the team's last two games. The 26-year-old isn't worth fantasy consideration given Jacksonville's complete inability to throw the football. O'Shaughnessy caught one of two passes for four yards in Sunday's loss to the Steelers. 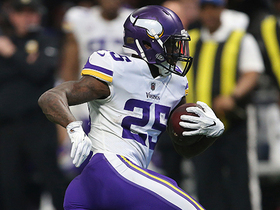 Analysis: O'Shaugnessy still played 85 percent of offensive snaps -- trailing only QB Blake Bortles & the offensive line -- but RB Leonard Fournette provided the only real production on Sunday. 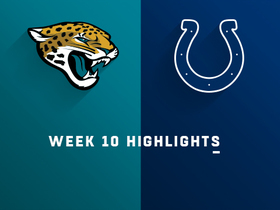 The Jaguars' pass catchers exhibited the brunt of the offense's inconsistency as Bortles totaled 18 attempts and 104 yards passing, 26 of which went to Fournette. O'Shaugnessy is clearly the top tight end currently on the team but that position has yet to hold much fantasy value this season. O'Shaughnessy caught five of six targets for 46 yards in Sunday's 29-26 loss to the Colts. Analysis: O'Shaughnessy returned to the field after missing the previous two games with a hip injury and played 52 offensive snaps, his highest total of the season. Sunday's reception and yardage totals were also season highs as the 26-year-old should remain the Jaguars' top option at tight end, though his fantasy appeal remains limited due to the general inconsistency of the offense. O'Shaughnessy (shoulder) is active Sunday against the Colts. Analysis: O'Shaughnessy has had three weeks to rest his ailing shoulder, as he missed two games leading up to the Week 9 bye. After returning to practice on a limited basis this week, he'll return to face an Indianapolis defense that has allowed three touchdowns to opposing tight ends this year. While O'Shaughnessy is atop the depth chart at the position in Jacksonville, his fantasy ceiling is limited after failing to record more than 30 receiving yards in a single game this season. O'Shaughnessy (hip) is questionable for Sunday's game against the Colts, Phillip Heilman of The Florida Times-Union reports. Analysis: O'Shaugnessy was a limited practice participant all week, which should put him on track to be available Sunday after missing the last two games. Fellow tight end David Grinnage (knee) is also listed as questionable, leaving Blake Bell as the only fully healthy option at the position for the Jaguars. 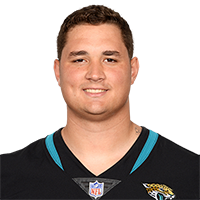 O'Shaughnessy (hip) was a limited practice participant Wednesday, John Oehser of the Jaguars' official site reports. Analysis: O'Shaughnessy was forced to sit out the Jaguars' last two games after suffering the hip injury Week 6 against the Cowboys. The tight end apparently isn't yet fully healthy following the Jaguars' bye week, but the fact that he was on the field for the first session of Week 10 is a step in the right direction. The 26-year-old's involvement in practices Thursday and Friday should provide a better indicator of his chances of playing Sunday in Indianapolis. O'Shaughnessy (hip) has been ruled out of Sunday's game against the Eagles, Phillip Heilman of the Florida Times-Union reports. Analysis: This decision doesn't come with much surprise after O'Shaughnessy sat out Week 7 against Houston and was still unable to practice Thursday while dealing with a hip injury. David Grinnage and Blake Bell are the only remaining healthy tight end options left for the Jaguars heading into Sunday. O'Shaughnessy (hip) is not in line to participate in Thursday's practice. Analysis: After being a limited participant in Wednesday's practice, O'Shaughnessy is set to be back on the sideline for Thursday's session. This is not a good sign for O'Shaughnessy's status for the Week 8 contest in London, and it appears he would have to return to practice in some capacity Friday to have any shot of playing against the Eagles. In the likely event that O'Shaughnessy misses his second straight game, David Grinnage and Blake Bell will continue operating as the team's lone tight ends. O'Shaughnessy (hip) was listed as a limited participant in Wednesday's practice. O'Shaughnessy (hip) isn't expected to practice Wednesday. Analysis: O'Shaughnessy missed Sunday's 20-7 loss to the Texans due to the hip injury, allowing recent practice-squad callups David Grinnage and Blake Bell to split the snaps at tight end. The extent of O'Shaughnessy's setback isn't fully known, but it's not the most encouraging sign that he's opening Week 8 preparations with an absence at practice. He'll have two more chances to prove his health before the Jaguars decide on his fate for the matchup with the Eagles this weekend. O'Shaughnessy (hip) has been ruled out for Sunday's game against the Texans. Analysis: With both Austin Seferian-Jenkins (core-muscle injury) and Niles Paul (knee) already on injured reserve, O'Shaughnessy's absence represents yet another hit to a battered Jacksonville tight-end corps. Unless Jacksonville supplements its depth at the position prior to Sunday's game, David Grinnage and Blake Bell will work as the team's sole tight ends in Week 7. O'Shaughnessy (hip) isn't in line to practice Thursday, John Reid of The Florida Times-Union reports. O'Shaughnessy was a limited participant in Wednesday's practice due to a hip issue. O'Shaughnessy played 36 of the Jaguars' 48 offensive snaps (75 percent) in Sunday's 40-7 loss to the Cowboys. 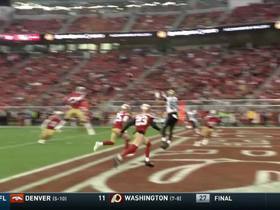 He finished with three receptions for 29 yards on four targets. O'Shaughnessy caught three of his six targets for 27 yards in Sunday's 30-14 loss to the Chiefs. 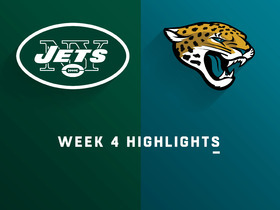 O'Shaugnessy caught two of three targets for 24 yards in Sunday's win over the Jets. Analysis: O'Shaugnessy saw only 17 offensive snaps through the first three weeks of the season, but he played 34 of 77 offensive snaps in Sunday's 31-12 blowout. The 26-year-old finished only two snaps behind starting tight end Austin Seferian-Jenkins, who has struggled to provide much production this season. O'Shaugnessy should remain the Jaguars No. 2 tight end for the Week 5 matchup with the Chiefs. O'Shaughnessy caught his lone target for a 17-yard gain during Sunday's 31-20 win over New England. Analysis: Where has this Blake Bortles been? With Leonard Fournette sidelined, Bortles slung it around for 377 yards against the Patriots -- a style of offense seldom seen in Jacksonville. Even with that kind of performance, O'Shaughnessy managed just one catch. Seeing as he has just two career multi-catch games and has never recorded 40 yards in a single contest, even a pass-happier Jaguars offense is probably not enough to warrant much attention to the No. 2 tight end. O'Shaughnessy (illness) is active for Sunday's wild-card matchup against the Bills, John Oehser of the Jaguars' official site reports. Analysis: O'Shaughnessy was a late addition to the injury report Friday but appears to be over whatever ailment he was dealing with. Short of a five-catch game in Week 16, which included a touchdown, O'Shaughnessy hasn't had much of any fantasy value all season. Expect him to have a limited role in the offense behind starting tight end Marcedes Lewis once again. O'Shaughnessy is listed as questionable for Sunday's game against the Bills due to an illness, Ryan O'Halloran of The Florida Times-Union reports. Analysis: O'Shaughnessy's status will depend on how he is feeling closer to game time. Should he ultimately sit out, look for Ben Koyack to see more snaps as the No. 2 tight end backing up Marcedes Lewis. 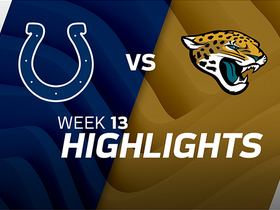 Jacksonville Jaguars fake a field goal for a first down against the Indianapolis Colts. 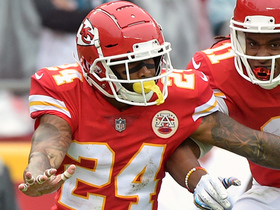 Kansas City Chiefs safety Jordan Lucas weaves through the entire defense after intercepting a pass thrown by Jacksonville Jaguars quarterback Blake Bortles. 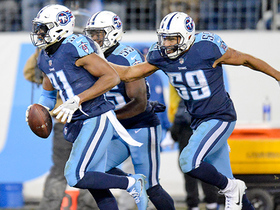 Titans punch ticket to playoffs with Kevin Byard interception. Jacksonville Jaguars quarterback Blake Bortles strikes a pass to tight end James O'Shaughnessy for an 11-yard TD. 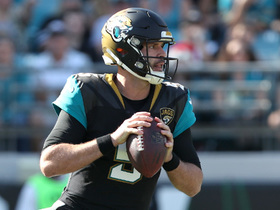 Jacksonville Jaguars quarterback Blake Bortles finds tight end James O'Shaughnessy for 15 yards. Week 13 of the NFL season was filled with crazy runs, last second finishes, perfect throws and dazzling catches. Here is a look at the top plays from Sunday.